Douglas and Jefferson County officials (as well as many Colorado residents and other similarly affected federal/state/local agencies) will likely remember the 2002 flood season in a much different way than their neighbors to the north and east. Colorado's worst wildfire ever-the Hayman Fire, which scorched nearly 138,000 acres in Park, Teller, Douglas and Jefferson counties between June 8 and July 2, created a heightened awareness concerning flash floods and threatened water supplies. While the State's prevailing water worries remain focused on historic drought conditions and depleted water resources, the rapid deployment of early flood detection equipment and the implementation of specialized precipitation forecasting and notification services in 2002 rivaled that following the 1976 Big Thompson Canyon flash flood. In spite of the drought, some flooding did occur this past year in the District with a few events escaping nearly unnoticed. The District's flood prediction program tied the year 2000 for a record low 23 days of flood potential. The National Weather Service (NWS) issued no flash flood watches that affected the District during 2002, setting another record for the 24-year-old program. Flash flood warnings were issued for 2 days (July 3 and August 5) based on observed and estimated storm rainfall. Before the fire was under control, the U.S. Forest Service contacted the District concerning how to address the fire-related flash flood threat and what types of early detection equipment were available for rapid deployment. With the Hayman Burn Area being outside the District, the District's ability to help financially was limited. The District did, however, provide the USFS with a list of contacts from Jefferson and Douglas Counties, the State of Colorado, the Denver Water Department, the U.S. Geological Survey, the NWS and DIAD Inc. The District also participated in the initial meeting held in Jefferson County where a recommendation for deploying ALERT gages was made. Subsequent to that meeting, things happened very quickly due to the urgent nature of the problem. A current Denver/District project to expand the ALERT system made immediate access to equipment possible. With the full support of and swift actions by Brian Schat of Denver, Denver Public Works officials quickly approved delaying their project and assisting their neighbors to the south and west. DIAD provided the communications, sighting, installation and data collection/display expertise; and as soon as fire managers declared it safe, five Denver ALERT gages were deployed in the field. A short time later a more-distant good neighbor, the State of Ohio, provided 20 additional stations. Readers interested in Hayman early flood detection system can find more information from the District's "Fire Weather" page at alert.udfcd.org. 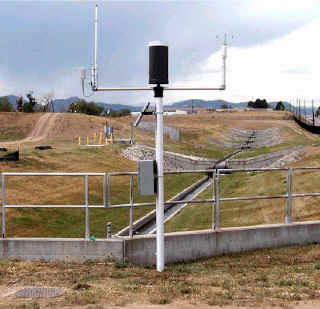 A May 2002 report entitled: An Evaluation of the Boulder Creek Local Flood Warning System is now available from the District. Dr. Eve Gruntfest, Kim Carsell and Tom Plush with the Department of Geography and Environmental Studies at the University of Colorado at Colorado Springs conducted the study. The Boulder/Boulder County Office of Emergency Management was the local sponsor. The report includes findings from recent Colorado and U.S. flood disasters and recommends ways to improve Boulder's local flood warning program, which has been serving the community for the past 24 years. A public survey revealed what floodplain residents understand about their community's flood threat, the warning process, and personal flood safety. 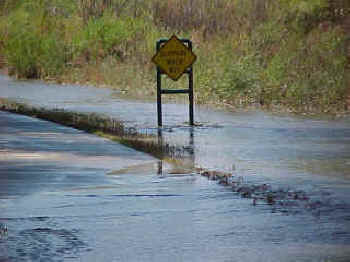 The report recommends that the District take a more active role in educating the public concerning flash flood dangers and personal safety actions. The District intends to investigate how to best implement these recommendation in 2003. A copy of this report can be obtained from the District's website. The Emergency Managers Weather Information Network or EMWIN is a national program supported by the National Weather Service. It provides an effective low-cost way to disseminate current information about severe weather and floods (watches, warnings, advisories, and other graphical and text-based products) to local decision-makers and citizens using satellite, radio and Internet communications. The technology has the potential to include local weather information not originated by the NWS and by adding a few enhancements, email notifications and text paging can be automated. A hybrid EMWIN system like this has been developed by Harris County, Texas to serve the greater Houston area and surrounding counties. In November the District with the Colorado Office of Emergency Management hosted a meeting with local area emergency managers and invited Houston guests to look at developing a similar system for the District. A consensus was reached to move ahead and plans are currently underway. The District has budgeted $15,000 to assist with developing the EMWIN-Denver project in 2003. The Community Collaborative Rain and Hail Study (CoCo RaHS) is a research and education project designed to involve local citizens of all ages in helping scientists better understand localized rain and hail patterns from spring and summer thunderstorms. The project is lead by Nolan Doesken, Assistant State Climatologist with Colorado State University's Colorado Climate Center. The District helped fund a student intern from Metropolitan State College (Christopher Spears) to expand CoCo RaHS in the Denver area this past year. By the first of August, 185 new applications had been processed from the Denver area and volunteers were being trained. The District and many other local sponsors will continue to support CoCo RaHS in 2003 with the goal of eventually having one observer for every square mile. Anyone interested in becoming an observer should visit the CoCo RaHS website at www.cocorahs.com. The District's ALERT flood detection network continues to expand and provide valuable early flood detection and decision support for local emergency management and response agencies. The total system is now comprised of 157 stations measuring rainfall at 135 locations, stream/reservoir water levels for 76 points, and weather data (wind, temperature, humidity, pressure and other parameters) at 17 sites. The District's ALERT web server continues to be a highly desirable and reliable means of accessing ALERT data in real-time. Following a large storm in July of 2001, Denver Wastewater Management officials asked the District to incorporate alphanumeric paging to notify key people when messages and storm track forecasts were being issued. This practice proved useful and was continued in 2002. The District also acquired software from NovaLynx Systems, Inc. to automatically send pages when user-specified ALERT gages alarmed. Denver officials participated in testing this process in 2002, again with favorable results. New ALERT weather station & stream gage on Marston Lake North Drainageway. ALERT system expansion in 2002 consisted of 7 stations: a rain/stream gage at Powers Park on Slaughterhouse Gulch in Littleton; a combination weather station/stream gage on Marston Lake North Drainageway in southwest Denver; a rain/stream gage co-located with an existing long term stream gage (Bear Creek at Sheridan) and 4 new stations installed by the City of Boulder to measure rainfall and stream levels on the lower portion of South Boulder Creek downstream of Eldorado Springs. Some additional stations in Denver and Aurora are expected to be online by April including a rain gage at the Denver Zoo and a weather station at Aurora Reservoir, among others. New stream gages will soon be operating on Sanderson Gulch, Lakewood Gulch and the South Platte River in Denver, and on Sand Creek and Murphy Creek in Aurora. DIAD Incorporated of Longmont provided the 2002 ALERT maintenance services for the 11th consecutive year. Looking ahead, the District intends to improve its web server capabilities in 2003 by incorporating XML features that integrate useful weather and flood data from other online sources into single displays. Additional XML applications will focus on simplifying user interpretation of stream level information. The District's flood prediction program provides forecast and notification services directly to District local governments from 15-April through 15-September each year. 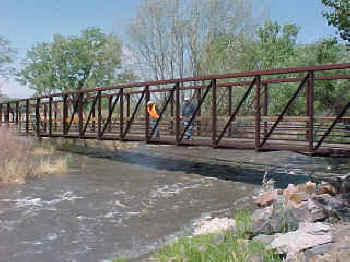 HDR Engineering, Inc. Hydro-Meteorological Services of Denver provided the forecasts during 2002. Bryan Rappolt served as HDR's project manager and lead meteorologist. John Henz provided overall training and support for HDR staff, and occasionally performed his familiar role as lead operational forecaster. Meteorologist Robert Rahrs was new to the program this year and was later joined by William Badini, a 4-year program veteran. Daniel Henz, a University of Arizona meteorology student and son of John, provided technical support for HDR meteorologists. Bryan and John are long-term veterans of the program having 35 years of combined experience (11 & 24 years respectively). This was the second consecutive year for HDR as the District's meteorological services provider. Westerly Creek at Montview Blvd. Monday, June 3 Much of Boulder County's mountains received welcomed rainfall totals between 1 and 2 inches. The heaviest rainfall intensities occurred between 6 and 7 PM near Big Elk Park and Taylor Mountain in the northern portion of the county. Low threat messages were in effect for the District with the "all clear" being issued by 9 PM. Messages were re-issued at 10 PM for Douglas County when a surprise storm near Franktown produced 1.2" in less than an hour. 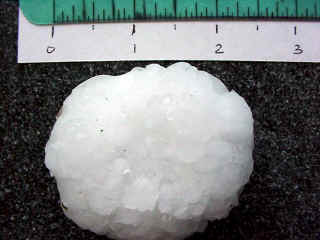 A quick-hitting hailstorm moved through East Denver during the evening producing 1.75" diameter stones. No major stream flooding was reported. Wednesday, July 3 Precisely one month after the first message-day of the year, the NWS issued an early morning (12:04 AM) flash flood warning for east-central Jefferson County and southwest Denver just north of Chatfield Reservoir. Heavy rain and hail was reported but the short-lived event ended before flooding became serious. Radar-estimated rainfall rates exceeded 3"/hr but the storm lasted no more than 10 to 15 minutes. Consequently, only minor street flooding resulted and the warning was later judged unwarranted. A Rocky Mountain News article indicated that as much as 2" of rain may have fallen but the ALERT rain gages a few miles east in Littleton measured maximum amounts of only 0.20 inches. Storms of similar magnitude in the Hayman Burn Area to the south had been cause for flash flood warnings on more than one occasion over the previous month. The fire was just declared fully contained on July 2. Wednesday, July 10 Flood potential existed in the District for a 4-day period beginning July 3, instilling hope that Monsoon rains would soon begin and provide some relief to the worsening drought and fire danger. On July 6, a 10-inch thunderstorm near Ogallala, Nebraska produced a flash flood that destroyed a large section of I-80 and caused the death of a truck driver-another indication that rich Gulf moisture had arrived in eastern Colorado. However, the rain that did occur in July was of little help. July 10 is noteworthy because of a severe storm in Douglas County that produced 2.56" of rain and very large hail (see CoCo RaHS observer photo). Only isolated heavy rains were reported with most of the ALERT system measuring totals of well less than an inch. A newspaper article credited this day with "the second large thunderstorm of the season" producing torrential rain, hail and street flood in the Denver area. Sunday/Monday, July 21/22 Another isolated midnight storm near Red Rocks Park in Jefferson County dumped 1.46" in 45 minutes causing the only rainfall rate alarms recorded by the ALERT system for the entire month of July. A Roxborough Park resident observed 1.59 inches. No stream flooding was reported. Monday, August 5 A heavy thunderstorm near DIA set a record high water level for the 2-year-old ALERT stream gage on Third Creek. The rain gage at that station measured 2.36" and prompted the NWS to issue a flash flood warning, the second and final warning of the season for the District. The storm at DIA occurred between 2:30 and 3:30 PM. Most of the metro area received less than an inch of rain while two gages in the Bear Creek basin measured over an inch. Tuesday, August 27 Nocturnal events seemed to be the norm for 2002. Consequently events like this one, judged quite significant by hydrologists and engineers, escaped media attention. In the early morning hours a 4-foot deep flood wave was observed cascading down Cherry Creek in Douglas County. A heavy rainstorm near Franktown east of Castle Rock caused the flood. The official Cherry Creek stream gage near Franktown recorded one of its highest peaks in recent history showing a very rapid 9-foot rise with an approximate (unofficial) peak flow of 5,000 cfs. The Parker stream gage reported a mere 2.5-foot rise with a peak flow of less than 200 cfs. Town of Parker officials photographed the event and documented the flood's rapid attenuation, noting that flows amounted to a trickle when it finally reached the Douglas/Arapahoe County line. The ALERT rain/stream gage at Castle Oaks Road recorded a new high water record of 7.2 feet at 4:26 AM, but the rain gage measured only 0.79 inches. One CoCo RaHS observer in the area reported 2.02 inches. County officials did confirm that water overflowed the county road between the bridge and its intersection with State Highway 83 (Parker Road) to the east. The peak flow at this location was estimated to be greater than 2000 cfs. Follow-up efforts are underway to more accurately document this flood. HDR Engineering is performing a meteorological reconstruction of the storm using archived Radar data and more detailed efforts will be made to verify peak flows and runoff volume. Cherry Creek flood of August 27. Flow over trail upstream of Stroh Road bridge. Cherry Creek hlood of August 27. Photo taken at ~7AM, East Bank Park footbridge in Parker just upstream of Main Street near Sulphur Gulch confluence. Friday, September 13 In addition to being the last big warm season storm of the year for the District, the urban flood that occurred on this Friday the 13th has become an annual tradition in Denver. Once again the I-25/Logan Street underpass (commonly known as Lake Logan) was inundated by stormwater-this time disrupting traffic for over 3 hours between 3:30 and 6:30 PM. A number of motorists were rescued from their vehicles. The ALERT system performed well and the potential for heavy rainfall was recognized well before noon. However, it is very difficult to predict exactly when and where storms will develop. ALERT rain gages along Harvard Gulch exceeded 0.5" in 10-minute alarm thresholds at 2:05 and 2:15 PM, and 1.0" rate alarms at 2:23 and 2:31 PM. Rainfall totals 1.06" to 1.18" were measured near the I-25 corridor between the Denver Tech Center and Broadway. This event was rivaled by the July 8, 2001 storm, which had twice as much rain measured with some point estimates exceeding 4 inches. TREX construction will vastly improve this historic drainage problem but until it does, future incidents can be expected.